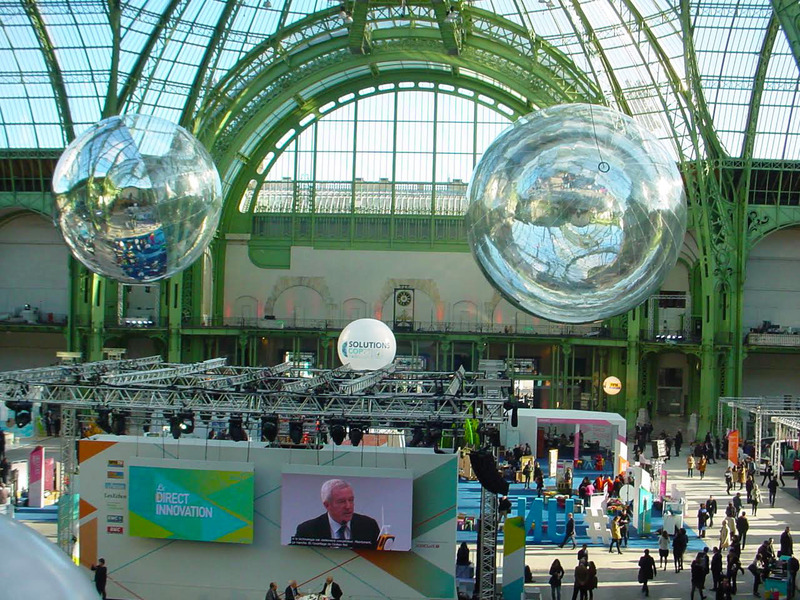 PARIS — The balls of Aerocene hang high above Solutions COP21, floating over ecocidal disaster-mongers as they sleepwalk visitors towards a total surveillance state. Inching through the mandatory metal detector and navigating a sea of security cops watching over this green energy industry exhibition, Tomás Saraceno’s eco-redemptive sculptural project, Aerocene: Around the World to Change the World, comes into view. 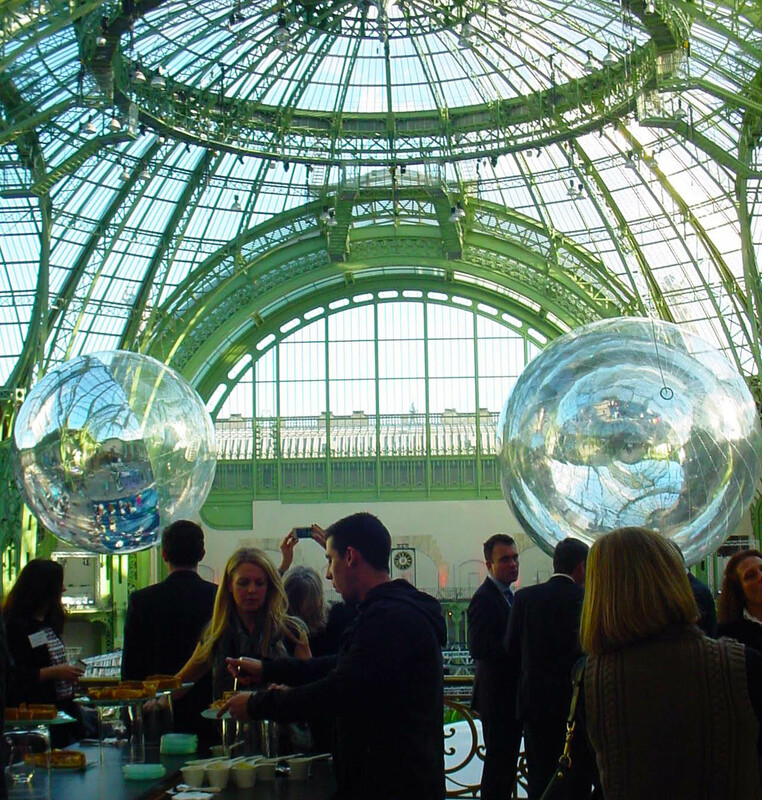 One of his two huge shiny mirror balls hovers beneath the central nave of the Grand Palais. Unfortunately, this looming fish eye brought back my repressed memories of Jeff Koons and his current exhibition of poorly repainted famous paintings placed behind shiny blue mirrored balls. 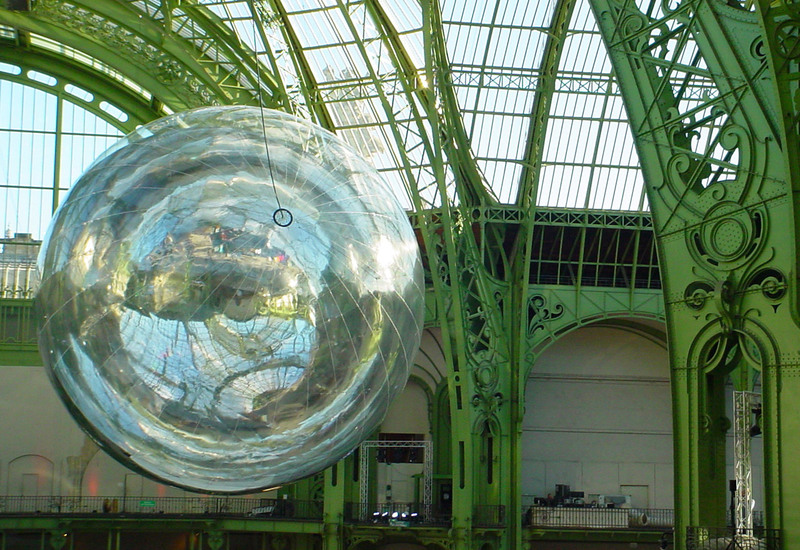 But once inside the Grand Palais, looking up at myself dazzlingly portrayed at the scale of an ant — the sculpture’s convex mirrored surface bulges toward the light source, making everything appear smaller in the reflections — I saw that Aerocene lacks Koons’s cynical touch. Gazing up into the balls offers a reflected, 210-degree perspective, what in virtual reality is called the allocentric mirror world — the bird’s-eye view of a virtual world. And, indeed, Aerocene’s mirrored surfaces form a virtual image since the focal point and the center of curvature are both imaginary points “inside” the mirror that cannot be reached. When viewed as a social project, this work’s unreachable utopian quality exudes the opposite sentiment of Koons’s low-hanging cynicism. We’re told often enough that as a species we are poised on the edge of the abyss. Aerocene, a product of Saraceno’s ongoing research and collaboration with the Massachusetts Institute of Technology’s Department of Earth, Atmospheric, and Planetary Sciences, is a direct response to the Anthropocene, the catastrophic era few want to own up to having had a hand in creating and that, by the time it was consecrated by scientists, was already irreversible. We are past the tipping point. Yet who are the “we” here to smear the entirety of humanity by casting it as the author of this late-modern “corporatocene” catastrophe? Aerocene holds up a greenwashing mirror to both “us” and the Anthropocene, a distorted mirror that recalls what Gene Youngblood said in Expanded Cinema: that the information explosion of the 1960s was “not a window on the future so much as a mirror of the past catching up with the present.” But more than a bent mirror, Aerocene intends to avert the Anthropocene by mixing practical ecology and political ethics into a contemporary mode of movement accommodation. We will travel by balloon. Aerocene, though here it is tethered down and looks like two giant Christmas ornaments spicing up the industrial eco-fair going on below, is a sustainability project whereby air-fueled kinetic sculptures are intended to float around the world without engines, buoyed only by the heat of the sun and infrared radiation from the surface of Earth. 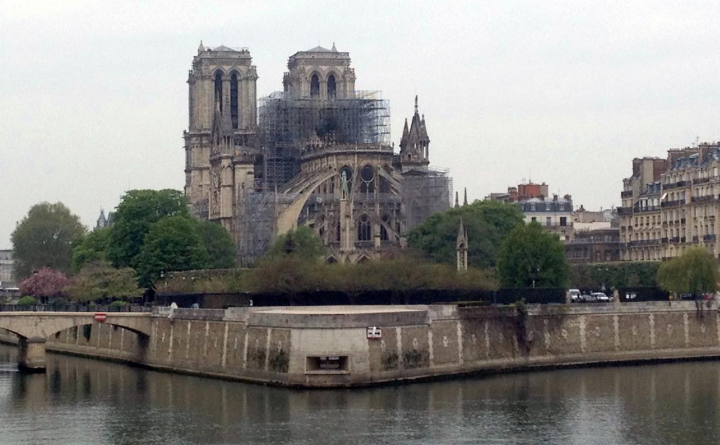 The sculpture is intended to stay float without burning fossil fuels, using solar panels, batteries, or gases. In that utopian sense it is a throwback to the immersive mirror created in 1969 by the Los Angeles wing of Experiments in Art and Technology (EAT) for the Pepsi-Cola Pavilion at Expo 1970 in Osaka, Japan. That 210-degree mirrored sphere was simply a lightweight structure built from 13,000 square feet of mirrored Mylar one one-thousandth of an inch thick, which spanned 90 feet in diameter and 55 feet in height. Unlike Aerocene, it offered a walk in a concave mirror and had a reflecting surface that bulged inward (away from the incident light). After peering into the two hanging sculptures from the floor of the Grand Palais, I sought out a more attainable bird’s-eye view — from the imperial, cordoned-off balcony terrace — so I could get a scaled view of the sculptures. 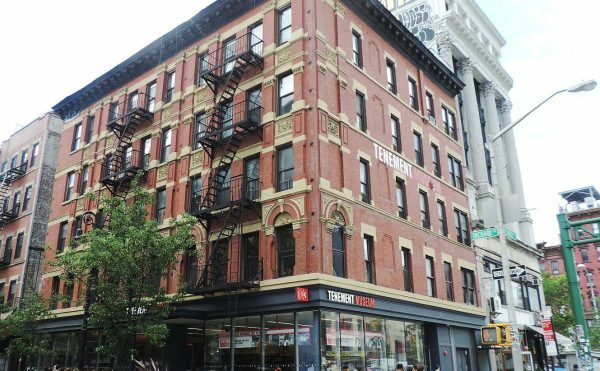 It was here that the high-stepping ecocide impresarios in suits were hanging out, around the quiche and wine bar. From my mezzanine-level vantage point on the Aerocene reflective globes, and from within the munching political eco-resource class, some troubling issues arose about the transcendent fish eyes approach to art and ideals of social change. They (the political power eco-class responsible for already having heavily damaged our natural world through global warming), in their suspended Bohemian Grove, know about us, but we know nothing about them because they are a privileged ruling power, a separate elite class. We don’t know where they are, we don’t know what they do, but they have the ability to know about us and observe us from above. So with Aerocene, Saraceno invited me (perhaps unintentionally) to think of the circulation of energy and resources by means of a “thermodynamic imaginary.” For me that imaginary offers a counter-narrative to capitalist-corporate culture, and a more nuanced way of naming the component that has become the agent of systemic, destructive change. Saraceno can summon all the smart green information he likes; he can shift scales, talk of saving humanity, or even of perceiving time and space from above the tipping point, but the problem with Aerocene of displaying the human figure as a tiny, recuperated detail from above remains. The looming-overhead technocrats and their superior, “higher” global overview constitute the value system that created our environmental doomsday predicament. I have had enough of the privatization of power and profit and the socialization of guilt and debt. If Saraceno’s balloons do not signal a delegitimization of top-down managerial governance, what does their materiality matter? Perhaps Aerocene’s aesthetic ideology of airborne perspective itself needs to pass over the Snowdenesque tipping point and take into account the iconography of mass surveillance. 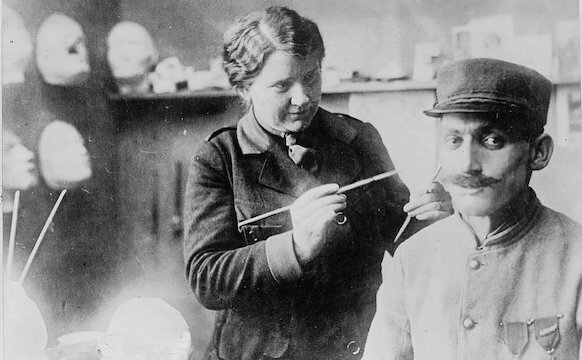 That would be a positive achievement for art and thought, as long as we are still here. 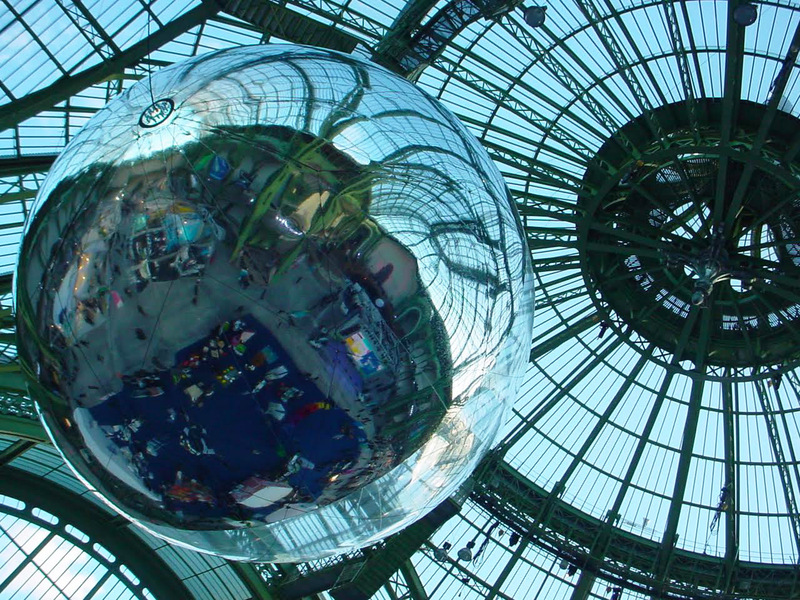 Tomás Saraceno’s Aerocene: Around the World to Change the World continues at the Grand Palais (3 Avenue du Général Eisenhower, 8th arrondissement, Paris) as part of Solutions COP21 through December 11.